Mrs. Hutchins is informed that, in Miss Berry's absence, her letter about admittance to the schools has been forwarded to the Principal, Mr. Green. Mr. Green will send her some information on entering the Berry Schools. 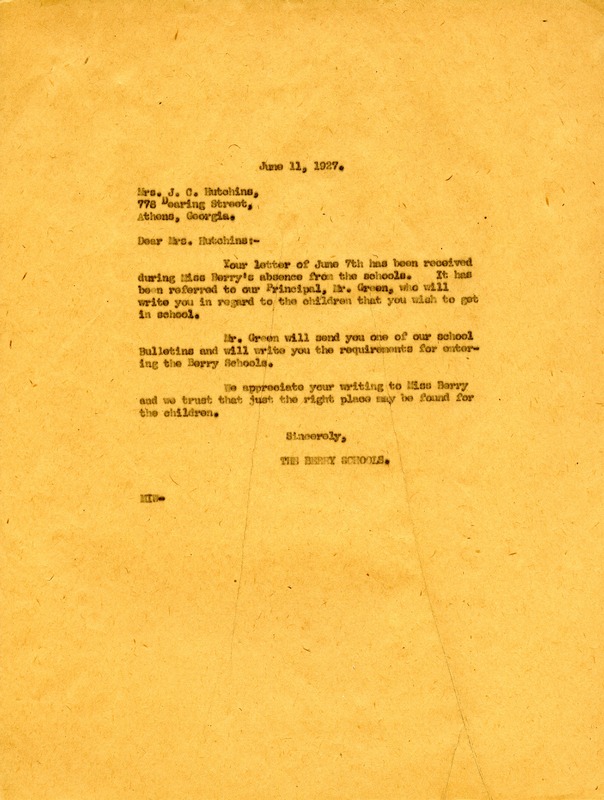 The Berry Schools, “Letter to Mrs. J. C. Hutchins from The Berry Schools.” Martha Berry Digital Archive. Eds. Schlitz, Stephanie A., Allison Moore, et al. Mount Berry: Berry College, 2012. accessed April 25, 2019, https://mbda.berry.edu/items/show/4543.